1. Why are you worth what you charge? Every wedding has a budget. There are so many things to pay for that day, and I can understand how it might seem like an okay idea to skimp on photography. However, when it is all said and done, out of everything you’ve paid for to go into this celebration, the photos (and video if you hire a videographer) are going to be how you look back on that day. They are going to be the photos you show your family for generations to come. Consider photography an investment instead of an expense of the day. I offer coverage for 8 to 12 hours, and a second photographer can be hired. Photos will be sorted and edited into folders within your gallery for delivery. The packages also come with a 10×10 album, so you have a tangible product to show from your big day. 2. Do you shoot with natural light, artificial light or both? I try to shoot with as much natural light as possible because I think it is gorgeous. However, that is not always an option for receptions and/or some indoor areas. I shoot with both natural and artificial lighting, but only use the artificial lighting when it is needed. 3. Do you back up your files in case of a tragedy (like a fire)? And do you have back up equipment? Yes, I have a backup system. The photos are uploaded to my computer after the ceremony, and are then in two places (the computer and the cards) until the editing is complete and your gallery uploaded. I also have two hard drives to back up my computer. One backs up the entire system and the other is just for photos. There have never been any issues, but I always want to be prepared for the worst. 4. Will I receive high-resolution images? Can we print those images or use them to create our own album? All of the wedding packages include high-resolution digital images from the day and an album. The album included with the packages is 15 pages (30 sides) and can have a customized cover. Additional pages can be added, but it would be an additional fee. Other products, like canvases and parent albums, can also be ordered. A print release is included with the packages, so you can create your own album as well if you’d like. I would be happy to direct you toward some high quality consumer labs to make sure you get the most from your photos. 5. How do you make us feel relaxed in front of the camera? 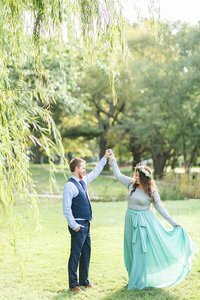 My goal is to build up a good relationship with the bride and groom during the engagement session so that when the wedding day arrives, we have a good rapport to go on. I work to get to know the wedding party and parents during the detail and getting ready images in order to help everyone relax when we take more photos later. There are so many emotions on a wedding day, and once everyone stops thinking about the camera focused on them, it’s amazing how many natural reactions are captured. 6. How do you describe your shooting style? What kind of editing is done on the photos? What is your turnaround time for the photos? I love to capture genuine emotion and movement in images. This is a joyous day, and that should be showcased, but I also want to show the love shown throughout the day. The love between the bride and groom, and their families. I would define my style as classic, genuine and bright. I will select the best images from the day to edit and to be delivered to you in a downloadable gallery. Typical turnaround time for the gallery is about three to four weeks. 7. Will you help me with my timeline for the wedding day? And on that note, do you tell the whole story of the day? 8. Do you have a contract? What happens if you get sick on my day? Yes, I have a contract, and I have never been sick on a wedding day or missed a photo session due to an illness. The contract is a way to protect the both of us, and if I were to get sick on your day, I would hire another wedding photographer to cover the wedding. 9. What will we do if it rains, snows or there is an other inclement weather? If there’s any inclement weather, we will adapt and continue. And if there’s rain, we will do portraits on the porch. Snows? How lovely would some photos in the freshly fallen snow be? Plans are situational, and to be prepared for all of them it depends on the time of year and the location. We will work together to make sure your day is as gorgeous as you’d imagined. 10. What would you like for dinner? This may seem like a silly question, but when a photographer is on their feet all day hustling to capture your big day, giving them a moment to sit down is so appreciated. If I’m allowed a chance to sit down, refuel and get some water, I will be better prepared to tackle all of the reception activities and not be thinking about how loud my stomach is growling. Something like this may seem like a no brainer, but I’ve heard some unfortunate stories. Justin and I became engaged in September of 2016, and our wedding is in October 2017. I am so excited for the planning process, and to be honest completely overwhelmed at times. There is so much that goes into that day, and as your wedding photographer I would strive to honor all your hard work and planning throughout the big day. To book your wedding or engagement session you can contact me at kelsey(at)kelseyalumbaugh(dot)com. Follow @kelseyalumbaugh on Instagram to see the more photos and like me on Facebook at http://www.facebook.com/kelseyalumbaughphotography to see more of my work.